How well do you know the caribbean art movement? What follows is an informal report on ‘The Caribbean Salon Event’ held on 29th March 2017 (Brexit Day), in the boardroom of Tate Britain, convened by David Bailey, Director of ICF (International Curators Forum) who acted as Chair and moderator. Some 20 invitees sat round the long table, in a convivial and attentive atmosphere, listening to, and commenting on presentations evoking aspects of two moments, past and present, of British Caribbean art: the emphasis was on the momentous pioneering role of the CAM period in the 1960s. That was then followed by three presentations by representatives of today’s contemporary scene, from different Caribbean islands, all with an international profile, which indicated that the CAM legacy was alive, world-wide, sixty years on. The group was made up of international curators and artists with interest in the Caribbean and other Diaspora regions, plus writers, art critics, musicians, and two archivists. ‘George Lamming famously observed that it was in the UK that he and other intellectuals of the Windrush generations first “became Caribbean”. It was the place where island peoples found one another and reflected on their shared experiences in the face of an often-harsh reception in their “mother country”. In the ensuing decades, reflections on expressions of selfhood both as a sense of individual identity, nationhood, regional integration and as part of an expanded Diaspora have ranged from the personal to the political, from the introspective reflection to the protest march. In the 1950s and 1960s, England was the place where artists came together from the newly formed “Commonwealth”. One crucial gathering was the formation of the Caribbean Artists Movement (CAM) in London in 1966. [It was} an important moment that influenced events in the 1970s, 1980s and 1990s. Like the Harlem Renaissance that emerged in New York during the 1920s and 1930s, CAM was a diverse collection of writers, critics and artists who were interested in developing a modern Caribbean aesthetic – an aesthetic that exploited colonial histories as well as defining a newly formed black British identity. First and foremost, let me mention two very special participants who came laden with CAM original documents and books Sarah Garrod, archivist at the George Padmore’s Institute founded by John La Rose, and Sarah White – his second wife – Secretary to the Board of the Institute. La Rose had also founded the New Beacon bookshop, located on the ground floor of the Institute, now owned by Sarah White. Both John and Sarah were actively involved at the time in campaigns, publishing and movements, including CAM of which he was a co-founder together with Edward Kamau Brathwaite and Andrew Salkey. The ‘Two Sarah’s’ spread samples of their treasure trove onto the table including letters, various copies of the newsletter and the journal Savacou (See illustrations). The latter was evocative by its contents and aims, of another pre-post-colonial cultural manifesto, in the Caribbean island of Martinique, in another European language, French, an earlier time, the 1940s, of the Tropiques review by Aime and Suzanne Cesaire, and colleagues in Fort-de-France, Martinique. The differences are substantial, with CAM commanding a larger, more diverse membership – writers, artists and activists – from the myriad of English-speaking islands plus Guyana, milling around in London, the capital city of their erstwhile common colonial power. CAM had a long-lasting influence – still extant – on the British art scene of the time, with many of its members, acknowledged as British artists of that era. The Guyanese, Frank Bowling (silver medallist in the same year David Hockney won the gold medal at the RA Art School), now Royal Academician,– who didn’t join CAM as he had set up a studio in New York to avoid any labelling, was nevertheless close to the movement’s founders: with Aubrey Williams, to the lay-man, they are the most well-known Caribbean artists of that era. In contrast, the smaller, earlier Martinique movement, although supporting the then fledgling visual arts development there, was principally a literary movement. 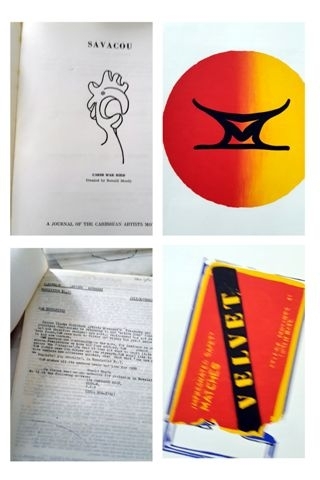 Nevertheless, both iconic publications, Savacou and Tropiques, are symbolic of the impassioned urge for the Caribbean literary class to authenticate, chronicle, and promote the emergence of a singular Caribbean identity during the early decades of the post-colonial era. In both cases, the founders demonstrated that inescapable sense of destiny. Accordingly, the speakers included three ‘CAM’ members, Paul Dash, Errol Lloyd and the scholar, Anne Walmsley – who wrote the CAM story. The new generation was represented by artists and curators, Lynn Parotti, Michael McMillan, Graeme Evelyn and Kat Anderson. According to him, from the medley of critics, writers, artists and activists with a CAM membership, the writers were the most famous, more so than the artists since, according to him ‘It was easier and better to get into print than to dabble with brushes’. However, despite inherent barriers to success in the British Art World, for any ‘Other’ artists, many CAM artists, including Llyod and Dash, have some of their works gracing museum walls in the UK, as well as in other public institutions like schools and colleges. Lloyd stressed the fact that CAM had been most fortunate that Anne Walmsley had been present at the dawn of the CAM launch. She possessed the investigative mind, and writing talent, together with the necessary detachment, to assess the interest and importance of the movement, which led her to write the definitive book on CAM, which contributed to the movement’s recognition as relevant, both to British and Caribbean history of art. Finally, Lloyd stressed that CAM’s relevance – because of the undiminished prominence of the theme of Identity – reaches out to other members of the Commonwealth, in particular in Africa, through international institutions such as MAAS (Minority Arts Advisory Services). To conclude, and alluding to the historic significance of Theresa May’s official BREXIT letter being despatched the day of the salon, 2017-03-29, to Brussels, Llyod evoked the potentially massive impact, in future times, of that national choice, both on British Identity, and on the multi-facetted minority groups living in England. The CAM artist ended his talk by projecting images of some of his paintings including: from childhood memories, aged 15: Dancing in the Street and Memory from Barbados (a group of uniformed youngsters crossing a meadow on their way to school). More mature works include After Gauguin: Manao Tupapau, and a portrait of Aubrey Williams. Today, Dash only paints abstract works. Anne Walmsley, world-respected scholar on the Caribbean, and a member of CAM – which, in her own words ‘sculpted my career’. Major works are: The Caribbean Artists Movement 1966-1972 (1992) for which she was awarded a doctorate by the University of Kent and Art in the Caribbean: an Introduction (2010)’. Earlier she edited two school anthologies of Caribbean writing – The Sun’s Eye (1968, new edition 1989), and, with Nick Caistor, Facing the Sea (1986) – and compiled Guyana Dreaming: the Art of Aubrey Williams (1990). The following quotes, all taken from: The Caribbean Artists Movement 1966-1972 a Literary & Cultural History, 1992 – New Beacon Books Ltd, London, by the narrator who was present at the very heart of the movement, aptly evoke the themes of the ICF Salon, including, inter alia, the Martinique connection – which is a strong component of today’s ICF pan-Caribbean programme. The Legacy: ‘Rex Nettleford, trade unionist and educator, essayist and editor, dancer and founder of the Jamaica National Dance Theatre Company, […] recognises the character and legacy of CAM :” The operative word is ‘Movement’. So that even without the advantage of bricks and mortar, or even a kind of established sort of hierarchy of leader, and led and officers, CAM carried with it a force, and it is that force which inspires, catalyses and instils new hopes and possibilities for this articulation, this creating, this confidence in self, which I believe are so critical . . . . One has to work on several levels at the same time . . . . Paths are made by walking, and while one is walking one has to be cutting the path. That’s our job now, and CAM must be seen as part of that process.’ P.322. Walmsley, echoed by Dash and Lloyd, evoked the atmosphere of friendship, keen interest in each other works and impassioned belief in CAM’s mission. Informal gatherings, apart from public meetings, occurred ‘organically’ in each other houses. However, CAM relied also on a sound foundation: it was a membership organisation on a fee-paying basis, with a monthly public meeting. 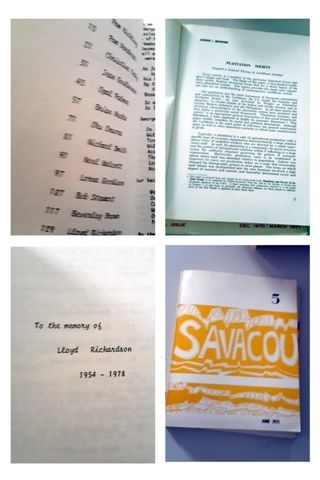 The two regular publications were a Newsletter and a journal, Savacou. Above all, there was among the founders, an all-pervasive obsession for records-keeping which made it possible for its history to be told with such meticulous brilliance in Walmsley’s book. Thereafter, it was the turn of 4 artists/curators of today’s Caribbean Artists’ generation to speak about the present, 60 Years After CAM. Lynn Parotti – London-based Bahamian artist, who studied art in New York, and whose landscapes explore the themes of migration, folklore and Diaspora. Parotti presented her striking installation ‘Tar Baby’ which, through the folktale narrative, addresses the burning issue of climate changes, and dramatic rising sea levels, the consequences of which are affecting primarily developing countries, whereas the causes originate in the developed world. ’Tar Baby’ first appeared in print in “The Wonderful Tar Baby Story”, the second of the ‘Uncle Remus Plantation Stories’ where Brer Fox uses Tar Baby (a doll made of tar and turpentine) to cunningly entrap Brer Rabbit. According to tradition, the Brer stories, African-American folklore tales, were originally told by a former slave, Uncle Remus, to a little white boy. The book was adapted and compiled by Joel Chandler Harris, and published for the first time in 1880-1881. The Tar Baby is also a novel by Toni Morrison, first published in 1981, which tells the story of star-crossed African-American lovers, highlighting the pernicious convolutions of the race issue. Michael McMillan – Writer, dramatist, artist/curator known for his landmark interdisciplinary installations such as ‘the West Indian front Room’. Born in London, McMillan’s acclaimed installation, first shown in the exhibition ‘Memories and impressions of Black British Homes’ – 18 October 2005 – 19 February 2006 – at the Geffrye Museum of the Home, ‘represents his vision of the traditional “West Indian” front room, drawn from his parents’ and relatives’ homes in the 1960s and 1970s’. Thus, many CAM members inhabited and/or traversed similar drawing rooms. McMillan’s recollection stresses the symbolic status of that front room which he described as: ’ garish, tidy, kitsch, and forbidden to kids’. The London installation, which attracted over 35,000 visitors – both from UK and abroad – was followed, in 2007, by a book, and a BBC4 documentary, ‘Tales from the front room’. Furthermore, outside the UK, MacMillan successfully transported the concept to other countries with an ‘Empire’ past, including the Netherlands – ‘Van Huis Uit: The Living Room of Migrants in the Netherlands’ (Imagine IC, Amsterdam and Netherlands Tour 2007-08), and Curacao (The Centre for Contemporary Arts – 2008) – where the front room was surrounded by salt (IBB, Curacao, 2008). More recently, in 2015, MacMillan’s installation travelled to South Africa, as ‘The Front Room Ina Joburg’ at the Fada Building, University of Johannesburg, Auckland Park. MacMillan ended his presentation, remarking wryly that he had just heard that two British artists were currently creating, here in Tate Britain, their own installation of a ‘West Indian front Room’. Graeme Evelyn – A multimedia visual artist, musician and curator – whose varied body of work comments on cultural social identity, politics and language. Kat Anderson – Curator and producer interested in telling stories of underrepresented members of the black Diaspora. Recently she co-curated, with Graeme Evelyn ‘Jamaican pulse; Art and Politics from Jamaica and the Diaspora’. Both, Evelyn and Anderson spoke about the exhibition, ‘Jamaican Pulse; Art and politics from Jamaica and the Diaspora 25 Jun – 11 Sep 16’ held at the Royal West of England Academy , in Bristol which was organised in partnership with the Jamaican High Commission, and supported by the Arts Council England and the Art Fund. There were approximately 100 works by circa 19 Jamaican and Jamaican-born artists, residents of Jamaica, or the Jamaican Diaspora in UK and America. Many of the contemporary works had also been exhibited in the Jamaica Biennale, 26th February -28th May 2017, in the National Gallery of Jamaica (NGJ). The NGJ, which opened in 1974, is the oldest and largest public art museum in the Anglophone Caribbean, with a large collection of early, modern and contemporary art from Jamaica. Evelyn then spoke of his current commission for the Diocese of London to create the new permanent contemporary altar piece (Reredos), the Eternal Engine, for St Francis at the Engine Room in Hale Village, Tottenham, in London. The hand carved painted relief sculpture, will measure approximately 5 x 3 metres, making it one of the largest permanent contemporary sculpture work ever installed within a modern sacred space in the UK. The Eternal Engine will also be for the artist his second Church of England altar piece commission, after the Reconciliation Reredos for St Stephens Church in Bristol. St Francis at the Engine Room, due to open in September 2017, will cumulate the functions of place of worship and community centre, at the heart of one of the most deprived areas in England, Hale Village Estate and neighbouring Ferry Lane. Finally, David Bailey rounded off the Salon, by reminding the audience of the next ICF venture, the Diaspora Pavilion at the Venice Biennale, which, in 2017, represents, a prestigious post-CAM development. ICF, in partnership with UAL (University of the Arts, London), has been awarded £300,000 under the scheme ‘Tactical Interventions’, to curate the first ever ‘Diaspora Pavilion’. Ten artists from racially and culturally diverse background have been selected to be mentored by, and work with, international experts, with the aim of showcasing their work at the Venice Biennale.